Summer looks like it might not be with us much longer. Is your central heating thermostat up to the challenges of the coming colder weather? Fancy an upgrade? Imagine being able to control your central heating without having to get out of your cosy bed, just by using your mobile phone. That's what one RST Electrical client based in Worksop can now do. RST Electrical recently installed a Nest thermostat in their Worksop home, which replaced a dated thermostat. The stylish Nest thermostat can be hard wired into a permanent position, or with the addition of a stand can be located anywhere in your home. You'll never have to battle with confusing thermostat programmer. 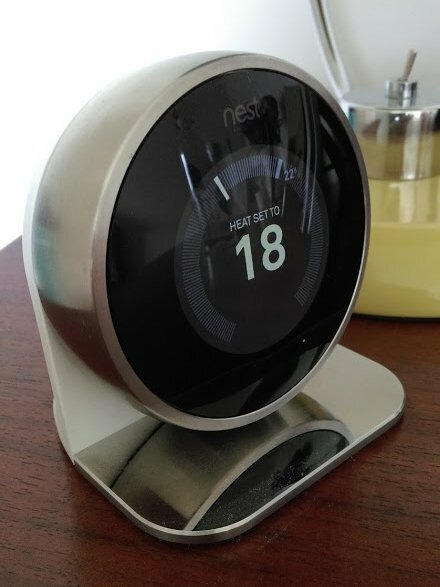 Nest learns how you set your heating after a few days and creates a schedule to match your needs. Using the Nest app, each day, you can see exactly how long you have been using your heating for. At the end of each month, you receive an email report of your usage. Nest even knows when you are out of the house so you don't waste money heating an empty house. That much control could lead to possible savings on your heating bill. What are you waiting for? Nest thermostats range from between £100 and £200 depending upon model. If you are considering upgrading your central heating thermostat, please call us on 07860 775307 or email info@rst-electrical.co.uk.